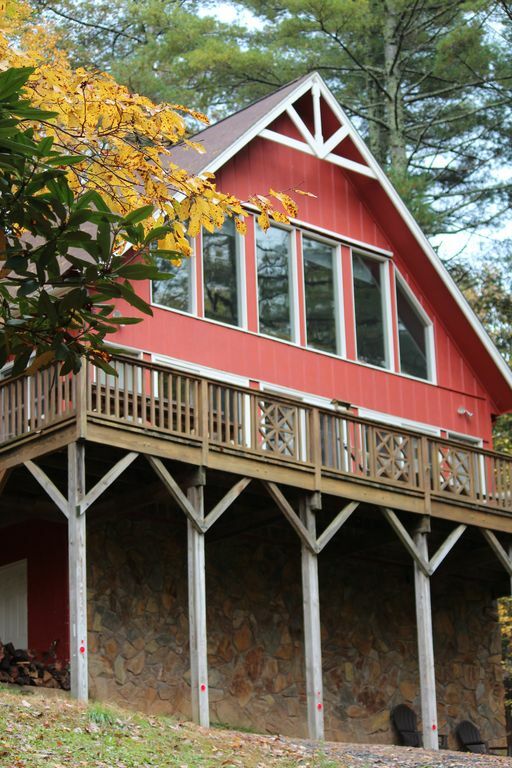 The Gingerbread House is located in the heart of the Blue Ridge Mountains! The cabin features three bedrooms and three bathrooms. The basement of this cabin has just been renovated to include an additional newly furnished living area and a new bathroom with a large, custom tile shower. The master bath has a Jacuzzi and separate shower. Upstairs in the master loft is a queen-size, Shaker-style, canopy bed and day bed. Downstairs offers a queen, double, single-size beds, as well as a queen-size, pull-out sofa. These sleeping accommodations provide ample room for eight people. NEW, INTERNET! Pets are NOT allowed, no smoking please! Credit cards accepted. The chalet has a 2 side wrap-around deck with a lovely view of the surrounding mountains; a trail to the Fleetwood Falls is just across the street. A lake for swimming and fishing is within a short walk. The New River flows serenely by at the base of the mountain for canoing and tubing at the base of this mountain resort. Some of the south's best golf courses are just a few minutes away, and ski resorts conveniently located within a short distance. Near Grandfather and Blowing Rock Mtn. I am the original owner of the Gingerbread House. My family and I bought the lot and built the home in 1996 as a vacation home. We live in Florida, but love to escape to the cabin for all of the beautiful seasons the mountains offer. It is quite simply "my happy place", and I'm delighted to share it with others! I chose the area of Fleetwood Falls to build a cabin because it is not a high tourist traffic area. Rather, it's charm is all the nature that abounds for hiking, biking, fishing, tubing, or just plain relaxing. It is also very near Boone and Blowing Rock and West Jefferson, 3 unique towns that have much to offer. We are so excited to announce we have just completed renovating part of the basement to include a great additional living area and full bathroom! The Gingerbread House has been built with love and care, and many happy memories have been made there from honeymoons, family times, Girl's shopping trips, Bachelor getaways, ski and golf trips, the list goes on and on. The unique location is close enough to larger towns, but far enough away to feel a sense of peace and relaxation. I love there are so many fun things to do and see, but I can also enjoy the splendor of quiet nature if I choose to do so. We loved staying here!!! We had everything we needed at the cabin. Patti was wonderful to work! Can’t wait to stay here again!! Although the main driveway is a bit steep that only added to the overall experience of staying in such a setting. The house is kept in very good condition and is large enough for several families to vacation together. Boone is only a short drive away if you need anything but my wife and I enjoyed the quiet location. I recommend this property for anyone looking for some peace and quiet. Had a wonderful time exploring the area. Was a little bit further out than anticipated from Boone, but not a bad drive! Loved sitting on the porch and rocking in the rockers! Patti's place was truly wonderful, the mountain views, the wild life, the two neighborhood dogs were meet and the people we encounter as we walked about the area. Patti was a great host. We loved it. Second time here, and we loved as the first time. Basement renovation beautiful. 100% recommended. A beautiful cabin nestled in a lovely quiet mountain resort setting with the New River at the base of the mountain, newly added living area and full bath added to basement of this home. Close to Boone and Blowing Rock. Hiking, biking, canoeing, tubing, fishing and so many outdoor activites nearby, including skiing during the winter months. Only 7 miles from the Blueridge Parkway!